Last year at Ignite we were all psyched that Microsoft gave us a replacement for the old Document Information Panel (DIP) in Word which allowed us to set metadata stored in SharePoint columns. DIP disappeared with Office 2016 (and you had to edit properties in the info settings page instead), and finally we got a replacement. However, it only worked for documents stored in SharePoint Online. I did a proof on concept of this with a colleague last year as well, so it was just a matter of time until it was properly release. Maybe a bit cryptic, and I haven’t tested if Word 2013 shows the SharePoint Property Pane, but at least Word 2016 shows it just fine against a document stored in SharePoint 2013. So, patch away and enjoy SharePoint properties once again in Word! I have a PowerShell script which today uses AzureAD commandlets to perform some write operations in Azure AD. This script is to be run on a schedule, and where better to run this than in Azure. It could be as a web job or as an Azure Function. This means we have to create and ADAL app which accepts a certificate, as well as make sure we can access the certificate from the app service. For this tutorial I’ll go with an Azure Function, but the steps are pretty much the same. Install the AzureAD or AzureADPreview command lets on your local machine. One of the cool features of the new hub sites is that associated sites inherit the navigation of the hub. This means you have one place to configure navigation, and you don’t have to resort to any of the numerous custom solutions out there to solve this. Hub sites makes it very easy to create small hierarchies of sites with a common navigation structure. 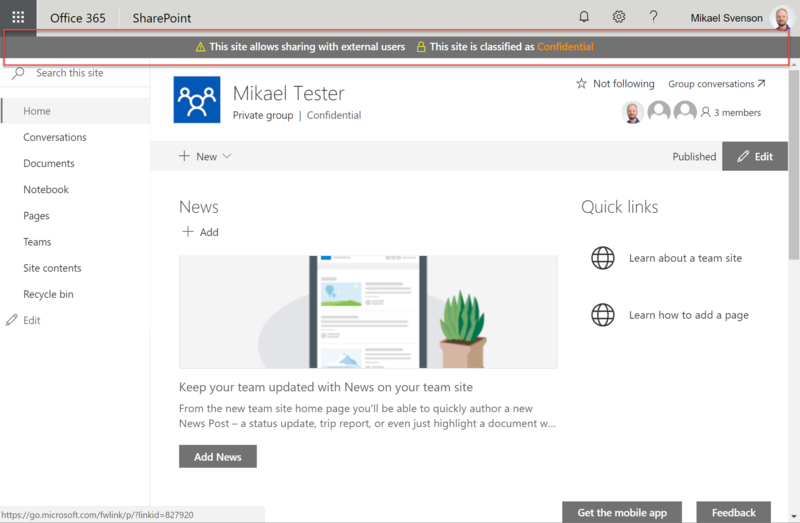 A lesser known fact is that the hub navigation also support managed navigation, a popular way to configure navigation since its inception in SharePoint 2013, and something constantly asked for in modern sites. This post will show that you can achieve it today, but you should probably wait until it’s properly supported.